Philamina, originally uploaded by gilfling. Philomena’s favourite sound is that of echo’s, gliding footsteps on stone floors; the drip, drip, drip of rain that comes through the gaps in the roof of her 645 year old miller’s cottage. She delights in the shadows cast by moonlit flowers and often takes walks at unsociable hours just to watch and listen. The sound of echo’s and the sight of shadow’s. 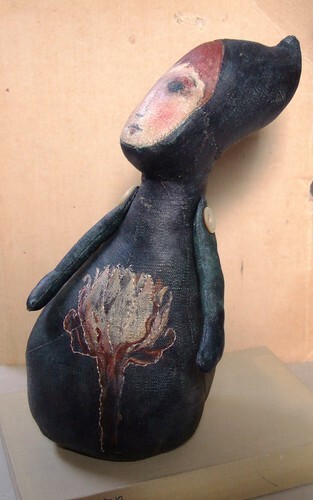 Philomena is the other character that I mentioned now resides inStudio 61 awaiting a new home. Can I let you into a little secret? Promise you won't tell? Every time I come to paint these faces....and I mean 'every' time.... I have that absolute panicky feeling as if I have never painted before. I feel as if I will make a mess and I just cannot fathom out how to go about it. It often takes me 2 or three attempts to get them just so. So there you have it, the trials of a sometimes incompetent painter! Mosaic monday 23rd March, originally uploaded by gilfling. 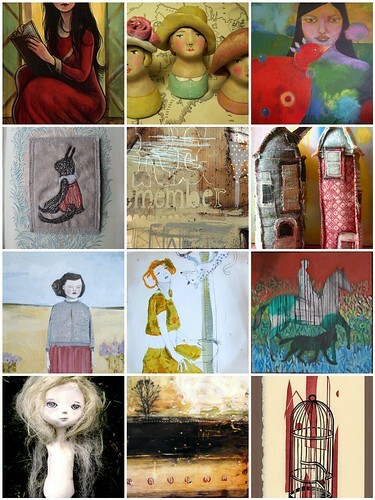 Many thanks to all the artists, artisans and crafters for sharing their work as ever. Verity, originally uploaded by gilfling. 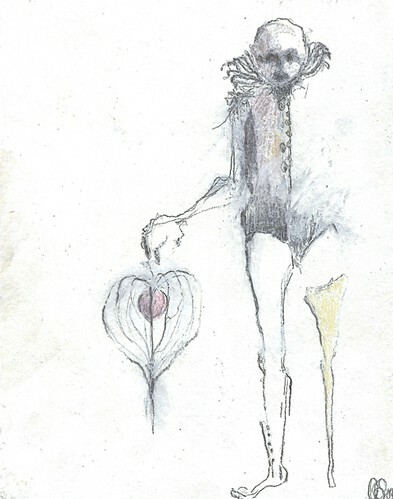 As nocturnal as an owl, Verity fills her garden with flowers that only bloom in the night. 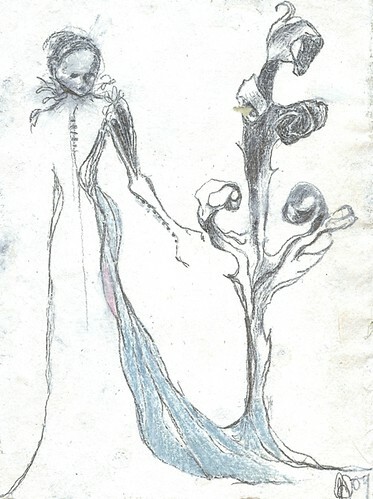 She wanders through the fragrances that sift into the moonlit air, stopping to listen for the other characters that only come out at this time. A constant tune can be heard from her lips as she dreams whilst awake and waits for dawn. 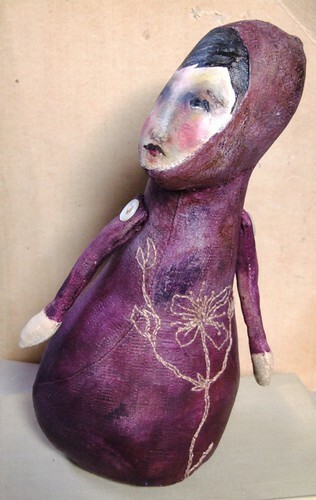 Verity is one of two new dolls now residing in the Studio 61 gallery in Lea, Derbyshire. I had a lovely trip out there last week - delivering her and a collection of (oldish) framed originals which are all being displayed for the next two weeks as I am guest artist. If you are in the area, it is worth a visit as it is such a lovely gallery with a wonderful coffee shop with the best coffee or chocolate cake! Other excitement is that I have just had it confirmed that my part time job as 'Memories are made of this project co-ordinator' (my job working in reminiscence work with older people) which was initially only a year long post and due to finish in August - has just had funding which will enable the project to be extended for another 2 years!!! This is incredible news, for the district, for the project as a whole, for me and in particular for the wonderful people I am lucky enough to work with. It is such an exciting and much needed project - I work in care homes, day centres and community projects as well as training staff in reminiscence work and really this extra funding is validation that the project is going well and that I am where I am supposed to be. Also........... sadness that my favourite, favourite TV series has just come to an end and I have to wait goodness knows how long for the next series. Seriously, this was one of the highlights of my week and made me cry with laughter as well as brought me to tears of sadness. Sunday evenings will not be the same! and................. I am just loving this new album ....... seriously....buy it...... and just sink into it. Wonderful. I do hope you have had a wonderful week and have a wonderful weekend to come! march 9th - mosaic monday, originally uploaded by gilfling. 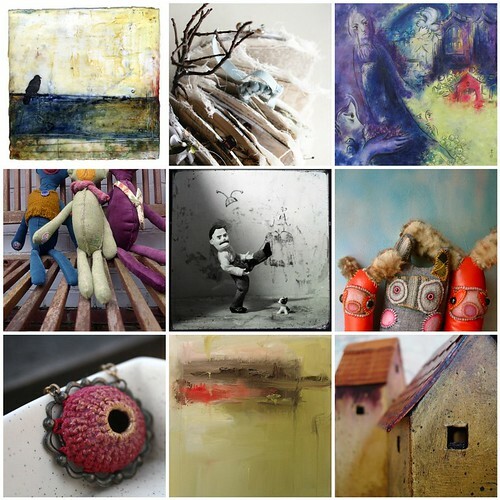 Many thanks to all the artists and artisans for sharing their wonderful work as ever! Right speaking of work....... I better get back to it. Enjoy these images and click through to find more of their wonderful creations.